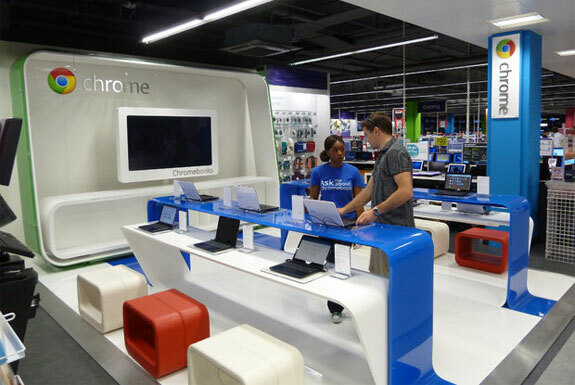 For one thing, the Chrome Zone isn’t an entire self-standing store but a section within a store, the PC World on Tottenham Court Road. And it’s a small section at that, barely wide enough for two thin tables. For another, the physical design of the Chrome Zone, while somewhat cool-looking, falls disappointingly short of what could be described as stunning. The photos, above and below, provide a pretty good sense of it. The retail area is characterized most by use of the solid colors of the Google logo and furnishings that lack right angles. Still, the Chrome Zone is vaguely worth a visit if you are a tech-centric sort and happen to find yourself in East London. Though you can purchase a Chromebook on Amazon and test one out on Virgin America and at a handful of hotels, the Chrome Zone is currently the only brick-and-mortar store where they can be found. Google has been cryptic in their plans for the Chrome Zone. By the time you read this their second store might already be open in the Lakeside Sopping Centre in Essex. It’s worth noting that the Apple stores started out somewhat modest also; the first one was in a shopping mall in suburban Washington DC. And that might be the best reason to go to the Tottenham Chrome Zone now. If the Google stores do become a big hit you can say you visited the humble beginnings of the very first one. « Camping? In New York City?